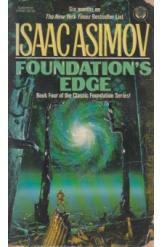 Foundation's Edge by Isaac Asimov, book four of the Classic Foundation Series. Book in a good condition, all pages intact. The Foundation series carries its story of future history and tells the story of man's struggle to fulfill his galactic destiny.